It is a -55 to 125°c Red/Blue/Yellow/Green LED temperature detector, can measure -55 to 125°c temper..
ST-1A digital thermometer using high-performance micro-computer chips and high-precision sensors, ca.. It is a Digital Tester/Red/Blue/Green Led Display Thermometer, Testing Temperature Range: -30°c~+70°.. It is a Digital Meter/Battery Capacity Voltmeter Tester/Adjustable Digital Panel Meter, Voltage meas.. It is a Digital Meter/5in1 Multifunction USB Tester, Input Voltage: DC 3 ~25V, Voltage Range Measuri.. 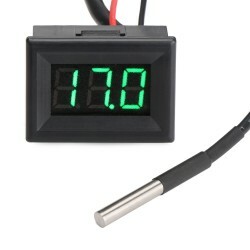 It is a Digital Tester/3in1 Digital Voltmeter Clock Thermometer, Working voltage range: DC 8~30V, Te.. It is a Digital Meter/Thermometer/Digital Temperature Meter, Input voltage: DC 12V, Temperature meas.. It is a Digital Meter/Digital Thermometer/Temperature Tester, Measuring temperature Range -50 ~ 110°.. It is a professional high speed using STM8 temperature control chip, set temperature and hysteresis .. It is digital temperature panel, with probe sensor 1-2 meter, can measure -50°c ~ 99°c temperature d.. It is a 300cm DS18B20 temperature sensor probe,Stainless steel housing: 6 * 50mm,Power Supply: 3.0V .. It is a DS18B20 temperature sensor probe,Lead length: 100cm,Power Supply: 3.0V ~ 5.5V,Wide temperatu..